It’s that time of year… Some parents are super excited to send their kids back, others are less excited… But the structure and routines are back. Lessons start up regularly again. Teachers are busy preparing classrooms and new materials. As a piano teacher, I’m prepping my studio by revising a few documents (like our studio assignment sheets) and gathering plenty of new books to try. (Anybody else love shopping for piano books as much as I do?!) And hopefully students are excited to get back and learn something new! This year, I’m trying something new – a back to lessons night to kickoff the new year. With all parents, I want to meet with them for just a few minutes. I’ll be sharing new copies of the studio policy and explaining any changes. Then showing off our new studio wide incentive program for the semester. And finally, I’m encouraging parents to start the year off right by encouraging students to set good practice habits from the start. Now we all know there are many ways to motivate practice and we ultimately want students to develop intrinsic motivation. That’s what will keep them playing through the hard times right? But to build those habits and add a little bit of help from home, I came up with a simple chart I’m handing out in this year’s beginning of semester packets. 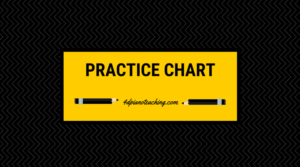 Yes, I made a practice chart. It’s what’s going on my fridge with a few other goals written underneath for my children to practice good habits themselves. I’ve laminated my copy and added in a few things that fit their age. Now my kids are young so these mostly include making their beds and cleaning up their toys. But for older kids, you could easily add so much more! There’s plenty of space for hand written instructions or add other icons to keep it simple. So cheers to a great fall semester! With plenty of parental support and awesome practicing each week at home. With fun and learning in every studio. Now I’m off to relish the last few weeks of summer. Enjoy!